Guest blogging is a popular and effective way to build backlinks for SEO purposes, however it has many more benefits than that. In this solo episode of the podcast, I talk about how to go about guest blogging, how to find websites to pitch your guest posts to, and how to approach the website owners. 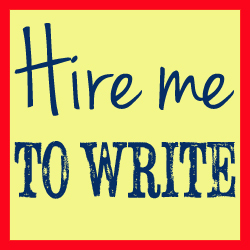 I also look at the many additional bonuses that guest blogging can bring to a freelance writer. Links and information mentioned on this week’s show. Hello and welcome to A Little Bird Told Me – the podcast about the highs, the lows and the no-nos of successful freelance writing. I’m Philippa Willitts and this is a solo episode. If you’re missing Lorrie terribly already, don’t worry – just tune in next week and we’ll both be here. Otherwise, please listen on. To make sure you never miss another episode of A Little Bird Told Me, go to alittlebirdtoldme.podomatic.com and subscribe to the podcast via RSS feed, iTunes or Stitcher Smart radio – or on the Podomatic page itself. That way, you’ll never miss another episode. Additionally, there you can find the link to our Facebook page and to the various websites and social media feeds of myself and Lorrie. Today, I’m going to be talking about guest blogging. Guest blogging can be a really effective way of getting your name out there, making some great connections and it can also have SEO benefits if you want to promote your website. However, there are some very clear no-nos involved in guest blogging, so today I’m going to talk about the benefits, how to do it, and perhaps most importantly, how not to do it. If you’ve got your own website – or even if you haven’t – guest blogging is a really good way to expand your reach and put yourself in front of other people’s audiences. I have done guest blog posts for various freelance writing websites and it just puts my name out there in front of people who probably wouldn’t have heard of me otherwise. It builds your brand and makes more people aware that you exist, basically. Another benefit of guest blogging is that you make contact with some really good people. The guest blog posts I’ve done have involved some really good conversations with other freelance writing webmasters. Also, sometimes being edited by other freelance writing webmasters is a really nice experience. It means that when I talk to one of those people on Twitter, they know who I am, they may be more likely to retweet me or reply, whereas prior to guest blogging for them, they had no idea who I was. And when you’re freelancing, especially when you’re internet based, those kinds of connections are really important – not just to grow your business but to reduce your isolation and have people you can get in touch with if you need advice or if you want to pass information on. And the more your writing is published on other people’s websites, the more you’re able to display your own expertise. If you’re a specialist in a particular area, if you write specifically about any topic really, then guest blogging on websites dedicated to that topic – not necessary freelance writing ones – will help to grow your authority. If you specialise in writing on food and drink, then if you can get some guest blog posts on some really prominent food and drink websites, then people will know your name and associate it with the great writing and expertise that you’ve shown. It grows your authority, basically, and when you’re on the internet, clients and potential clients don’t really know how good you are. So, if you can show that you’ve written for the top four food and drink blogs, then clients in that sector are more likely to take you seriously. Your status improves in that context. So, how do you go about the whole process of guest blogging? The first thing to do is look for suitable websites to host your guest blogging, and you want ones that accept guest bloggers, obviously. So the place to start is to think about the kind of websites you’d ideally like to appear on. Now, this might be top freelance writing websites, or top websites in your niche, so food and drink, travel, business – don’t just go and approach everyone. Start from the place you’d really, really like to be. Now, ideally, if you do specialise in a particular area, you’ll already know where the tops websites are and you’ll be familiar with them, which is a really great start and will save you a lot of work in the beginning if you already know the kind of content that these websites publish and the style they like their blog posts in. So, start with the top blogs in your area – really study their websites. You want to find out first of all – do they accept guest blog posts. If they do, they’ll probably have some guest blogging guidelines. You want to study those really, really carefully because if they have guidelines and you don’t stick to them when you contact them, especially if they’re a big website, they probably won’t even reply. Some guest blogging guidelines I’ve seen, somewhere near the bottom, have a particular ‘coding’ just to check that the person approaching them has read the whole document. So, I’ve seen guidelines that say things like, “Somewhere in the email, mention the word ‘red’, then I’ll know you’ve read the whole thing.” It’s a really amateur mistake to not check for that kind of thing and not follow it. Secondly, if you’ve got the information you need about the kind of writing they like and how to approach then, you need a brilliant idea for a post. Don’t just contact them and say, “Um, hey…would you like a…guest blog post…about travel?” because their whole website is about travel. They want to know specifically what you can offer them – they write all the time about travel. But if you recently did a cycling tour of Italy, and offered them a specific blog post about the specific things you learn about Italy when you go cycling there, they’re much more likely to take you seriously and think, “Oh, this person might actually have something to offer us.” So think carefully about what you want to propose – don’t just send a generic email. Now, it’s just wrong in so many ways – I’m not “Sir/Madam”, I’m Philippa or Ms Willitts, if you want to be formal. Next, if you can’t be bothered to separate the name of my site – Social Media Writer UK – from your email… it’s just blatantly a form email that goes to everyone, where the name of the site is inserted into the email. I don’t want a guest post about “Social Media Writer UK” – if you come to me and say “I have a guest post about the specifics of LinkedIn to promote your business”, then yeah, I might be interested. So, be sensible and think about it from the webmaster’s point of view. If you received an email, how would you want it to be? If you wanted someone you could really take seriously as a guest blogger, what would it say? And do that. Personalise each email you send. It feels like it adds to the hard work but it’s the only way to be taken seriously. If you’re not familiar with the main sites in your niche for some reason, or if you’ve tried those and had no luck, you might then want to search for other websites that accept guest blog submissions. Now, there are a few ways to do this – one of these is very common now, and I know this as much from the analytics on my own sites as anything – I get lots of referrals to my site from Google searches for things like, “Social media accept guest blog posts” and it’s clear that people are doing a Google search to find websites on a particular topic that accept guest bloggers. Now, there are some quite effective ways of doing this search, and I’ll provide examples in the show notes because it might be difficult to grasp just from listening. But basically, if you know a bit about how Google advanced searches work, you can really drill down a search so it gives you the results you need. The best way is to do a search for [open quotation marks] and then your topic of choice and then [close quotation marks]. Then you want a ‘plus’ symbol, then [open quotation marks again], then something like ‘guest blogging guidelines’, [close quotation marks],or ‘write for us’ in quotation marks. What this does is tell Google that the results you want are to do with your topic…and the reason they’re in quotation marks is so that all the words have to be together in that order. So, social media, in quotation marks, or internet marketing, in quotation marks. And the plus sign tells Google that not only do you want results with that topic in, but also results that have – again, in this exact wording, guest blogging guidelines, write for us, something like that. So, it’s a good way of drilling down your search so that all the results you get are your exact topic and are also sites that offer guest bloggers a chance to write for them. So once you’ve got your search results for that (and again, if it all sounded confusing, don’t worry – go to the show notes and I’ll give a written example that will make it all clearer!). So then you look through the results; look through the different sites that Google has brought back to you. And, a few things to check for: you want to make sure it’s not a really obscure with no readers – otherwise, you’re just wasting your time. One way to see how big the site is, is to look in Google Reader – do a search for that site – and it will tell you how many other people subscribe to the site in Google Reader. Now, this isn’t a fool-proof way of making sure the site is popular but it gives you a good indication. If it has 3 subscribers, you might not want to prioritise it. But, if it has 300,000, then yeah, you’ll probably want to go for it! Another way is to look at something called the page rank. You can get add-ons to Chrome or other browsers that will tell you at the top of the browser what page rank that site has. Now, again, Page Rank is something I believe Google don’t focus on anymore and, again it’s not guaranteed, but it can be a good indicator. If a site has a page rank of 0 or 1, then it suggests there aren’t that many backlinks to it, and that it isn’t that popular. You’re unlikely to find a site with 8, 9, or 10 so ideally, somewhere between 3-6 in page rank suggests a site has a good number of readers. Also, look at things like the Twitter account and Facebook page of the site – do they have lots of followers and fans? So again, by doing this, you can focus on four or five authoritative blogs you can approach. And the approach is exactly like I described earlier – personalise it, offer them something really good and don’t, in your initial email, make demands on how many back links you want because that’s another thing that makes webmaster switch right off. If I get a guest blog submission with a specification of how many backlinks they want, then clearly their focus is that rather than providing good content to my site. And if you think about it, why would I or any other webmaster purely want to promote your site? 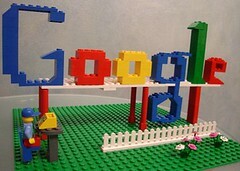 What webmasters want is things that their audience is going to enjoy and find valuable and useful. By studying the kind of content they already prefer, you can pitch your pitch carefully. So, do they normally publish really long, in-depth analysis posts; are they quite short, pithy and funny? Are they in the first person or the third person? Have a look at some of their most popular posts and make it clear in your email that you’re familiar and are going to produce something their audience will like. Because if they normally produce in-depth analysis posts, then the people who read that site do so because they enjoy in-depth analysis posts. So you want to provide something that the webmaster knows their audience is likely to enjoy, read and share with their colleagues and friends. Now, as well as getting the benefits of extra exposure, building your brand, raising your authority level, guest blogging also has other benefits, including SEO benefits. If you get a link in a post to your website from an authoritative, popular, well known site, that’s not going to do your site any harm. It’s a good thing. Like I said earlier, this shouldn’t be the main aim of your guest blogging because site owners deserve better than that and they can see through it in an instant. But think of it as an added bonus. Bearing this in mind, it’s worth thinking about how you’re going to word your link. Now, mostly, guest bloggers are offered an author box or bio box at the end of the post, which will say something like, “Philippa Willitts is a freelance writer who specialises in writing about SEO, social media and internet marketing. You can find her website here.” For instance. Now what you really don’t want is that last sentence – a link from the word ‘here’. The anchor text – the word or phrase that is clickable – you want that to be useful and relevant. So instead, you might say, “Philippa Willitts is a freelance writer, who specialises in writing about…” and have the link to your site clickable from the words ‘social media and SEO’ for instance. Some host blogs will let you provide links within the text of the post as well as the bio box, but don’t abuse this – only do it if it’s really relevant, such as in your travel writing, cycling around Italy post, if there’s something really relevant like, “This was different from when I cycled around Scandinavia…”, which you’ve written about on your own blog, so there could be a valid, relevant link from “cycled around Scandinavia”. Don’t just make the words ‘travel writing’ clickable, because that’s just not how it’s done, unfortunately! As well as the SEO benefits, there are also benefits of increasing your reach in a longer-term way than just that immediate post. If your post is so good, and so fascinating and well-written that people do click through to your website once they’ve read it, you can also, from there, if you make it easy via your website, have the potential to get them to follow you on Twitter, like your Facebook, join your mailing list or subscribe to your blog. So, make sure, as well as writing a brilliant guest post, when those people visit your site, it’s easy for them to find out how to engage with you. Make the most of the opportunity of very targeted visitors coming to your site. Make sure what they see there is brilliant and that it’s easy to find your Twitter, Facebook, RSS feed, LinkedIn account – whatever you’d like them to find. If you write something that’s brilliant for someone else and it’s good enough to make people click through to your site, if they then find really uninspiring content, or no updates for the last four months, or just a generally underwhelming experience, they’re not going to be impressed and your post won’t have much of a wider benefit for you than the immediate exposure itself. Now, if your own website is even slightly findable in the search engines or has even a modest readership, the chances are that, as well as wanting to guest post for other people, you might well also get guest post requests from other people. Now, as I mentioned earlier, in my case at least, it’s unusual for me to receive anything that isn’t a blatantly copied and pasted form email that doesn’t inspire me at all to give these people access to my website and readers. So, if you get approached, don’t devalue your website by accepting anything and everything just because it’s free content. You do yourself and your business a disservice by publishing some PR agency’s spun, dull, generic post that’s only written for the sake of getting some targeted links in the bio box. So think carefully before you give anyone else access to writing on your website. If it’s really going to benefit you, if it’s an amazing post that someone will write specifically for you, or if it has a good angle or edge, then consider it. If it starts with, “Dear Sir/Madam, I want to provide free content to your Social Media Writer UK site on the subject of Social Media Writer UK…” then add it to your spam folder, frankly. There are benefits of getting good guest posts on your site – it does give you free new content – but adding rubbish to your site does you no favours and won’t help clients take you seriously when they find it. So there we have information that will hopefully help you get some really positive guest blogging slots in our own niche that will help you to expand your brand awareness, your reach, your audience, possibly your social media followers and email subscriptions, and on the rare occasions, opportunities for you to help someone else in the same way. Just be sensible – think what you’d like to receive if you were the webmaster in question – and don’t try and trick people with copy and paste form letters. It doesn’t work; you’re wasting your time and their time. Does you no favours. Now, last week, Lorrie and I introduced a new segment for the A Little Bird Told Me podcast, which is going to be in every episode from now on, and that’s the Little Bird Recommendations. Every week, we’ll recommend something to our listeners. This might be something we’ve read, a brilliant Twitter update, a tip that we want to share, another podcast we like – anything and everything, really. So here we are – the second ever Little Bird Recommendation ever! My recommendation this week is a blog post that I’ll link to in the show notes, called Cease and Desist – for blog writing and marketing practices that have got to go. This is somewhat related to guest blogging practices in that it’s all overall about how to produce really good blog posts. Now, this post originally appeared on a website called Business 2 Community, and it has some really good advice – some of which seems sensible, but you’d be amazed at how many people break these rules. It’s got advice on avoiding clichés and buzzwords – I don’t know about you, but if I hear the phrase ‘laser targeted’ one more time, I might throw my computer out of the window. It has advice on making sure your title matches your content – I’m sure you’ve all had the experience of clicking on a link because it had an amazing title, and then the blog post being unrelated and disappointing. It advises against using bad stock photos – there are some embarrassing examples. 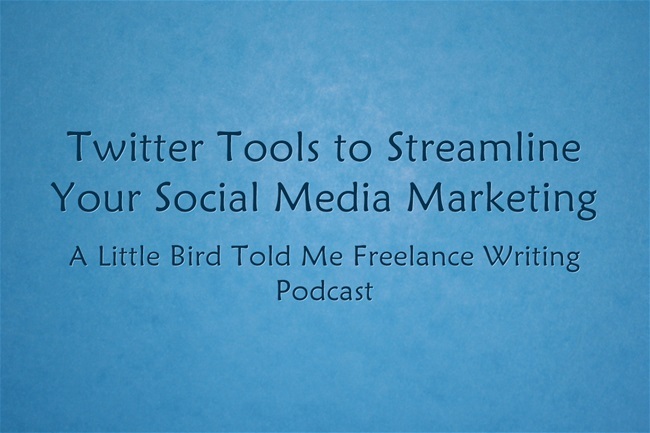 And also, talking about whether social media marketing really is free because although you don’t pay for accounts, however the time it takes makes it not free because our time has to be valued, especially if you’re a freelancer. So, anyway, I’m going to link to that post in the show notes and that is this week’s Little Bird Recommendation. I really hope you’ve found this episode useful, especially if you’re interested in guest blogging yourself or accepting guest bloggers. It will hopefully help you to have much more success in approaching even the most high profile and impressive websites. If you want to make sure you don’t miss the next episode, do make sure you subscribe to us on Stitcher Smart Radio, iTunes, RSS or join our Facebook page. All the links are in the show notes at alittlebirdtoldme.podomatic.com. Thank you so much for listening, I’ve been Philippa Willitts and we’ll see you next week. There are 11 million LinkedIn users in the UK, and 35% use the site daily. This means that, as a professional networking tool, it is really invaluable for any freelancer. which subjects should never, ever see the light of day on the site. so the potential for developing great relationships and contacts is huge. You don’t want to miss out on the connections you can make and the commissions you can earn, so listen up and get all the tips and tricks you need to make LinkedIn work for you. 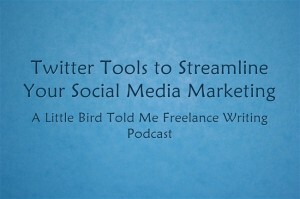 I make a freelance writing podcast called A Little Bird Told Me. The episodes are hosted on podomatic, and I also publish them on my main freelance writing site, but it would make sense for me to post episodes that are relevant to social media, SEO and tech writing here, too. So, the episode I made this week is all about how to carry out keyword research for SEO writing. Enjoy! It will often be expected of you, as a freelance copywriter, to be able to not only carry out keyword research, but also to know how to use it in SEO copywriting. In this episode, I talk about the basics of undergoing keyword research, and also provides information about writing for SEO in a way that does not alienate site visitors. This episode also contains a custom-made video especially for A Little Bird Told Me listeners. Find out how to carry out keyword research using the free Google AdWords Keyword Tool here.